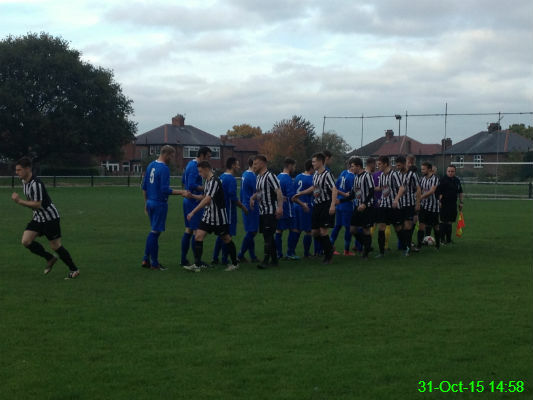 Heaton Stannington and Brandon United carry out the usual handshakes before their match begins. 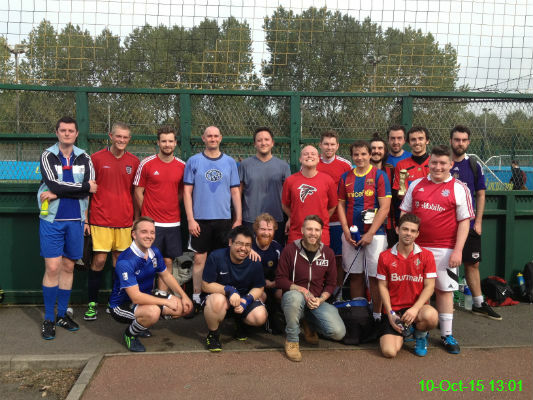 Heaton Stannington won 1-0 on a day that could have seen about 10 goals if anyone was wearing their shooting boots. My book is correct. 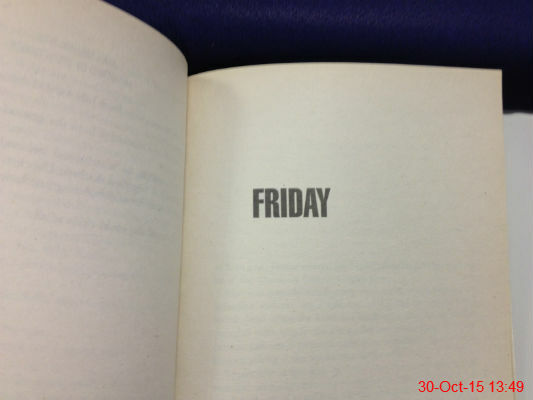 It is indeed Friday. 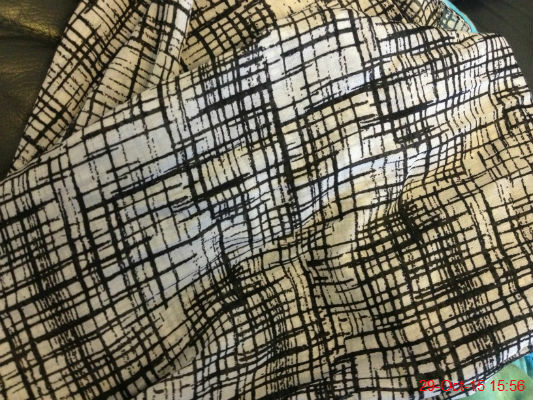 I bought this scarf recently from Matalan. I don't think you can ever have too many scarves. 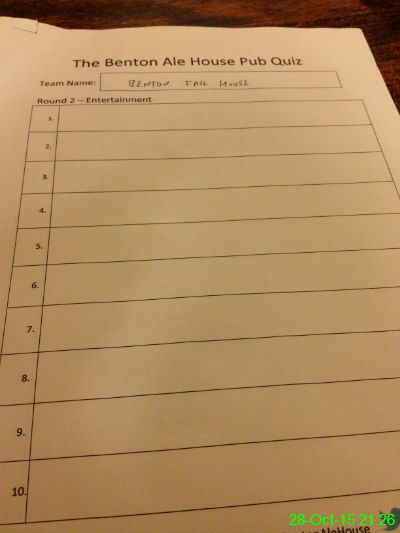 Our team name for the quiz at the Benton Ale House just about matched our ability. 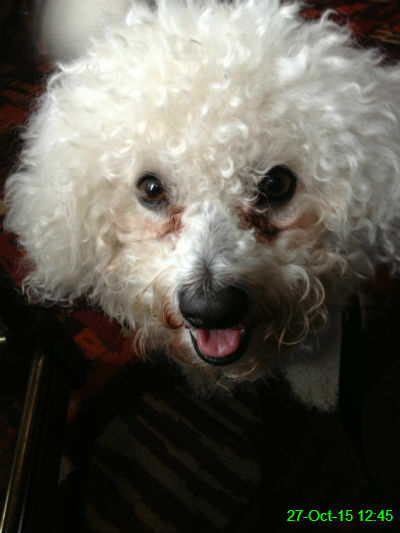 We enjoyed yesterday's walk so much that we borrowed Bilbo to go for another walk today. 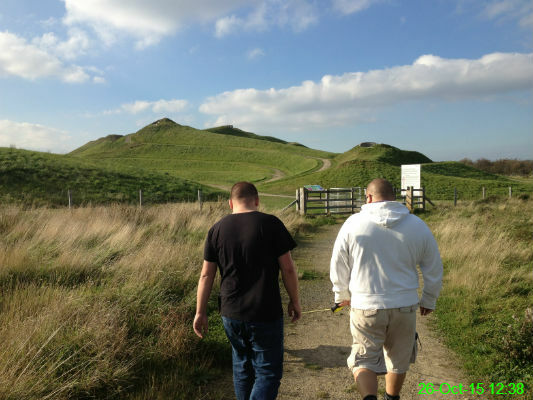 I went for a walk with Michael, Paul and Buster the dog around Northumberlandia in Cramlington. 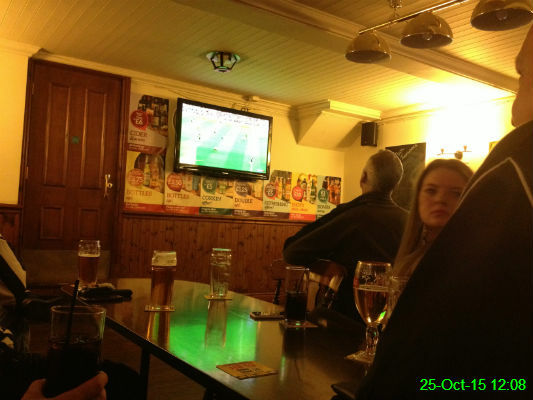 It was yet another disastrous derby day (that's 6 in a row) but at least we had a decent spot in the Benton Ale House to watch it. 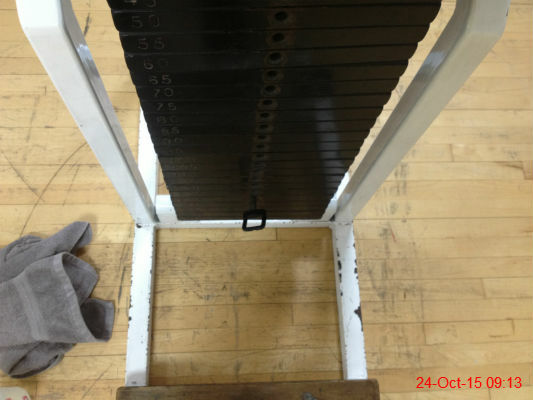 One of my favourite pieces of equipment in the gym - the calf raise machine. I couldn't be bothered to go to any effort for tea tonight. 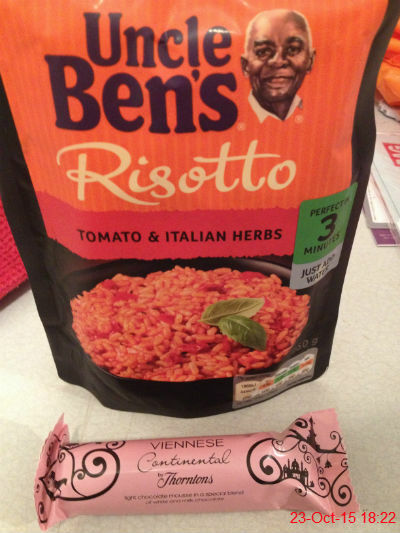 The risotto was £1 and I combined it with some peri peri chicken that was already in the freezer. The chocolate is one of my favourites and well worth a 50p impulse purchase at the checkout. 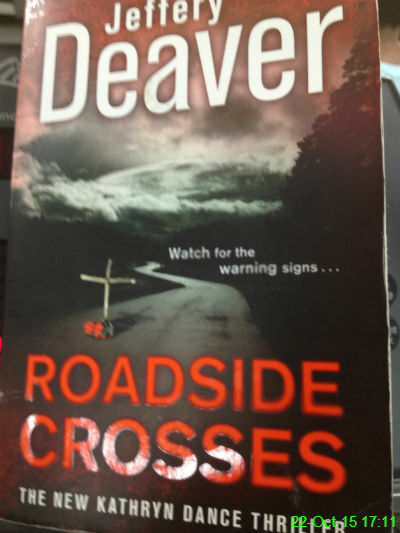 This is one of the few Jeffery Deaver books I haven't read, so when I saw it in a pub for 40p I couldn't resist. It's been a pretty good read so far. I haven't had this stuff for years! 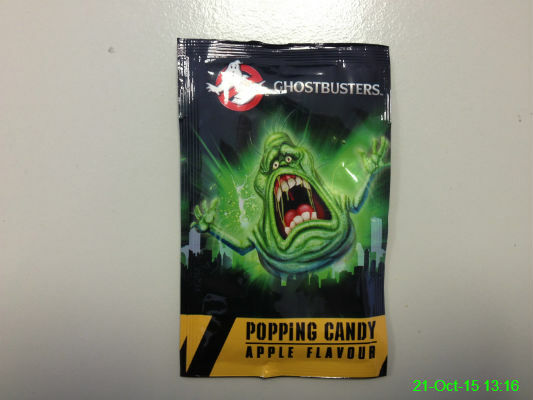 It sounded like a hailstorm in my mouth. 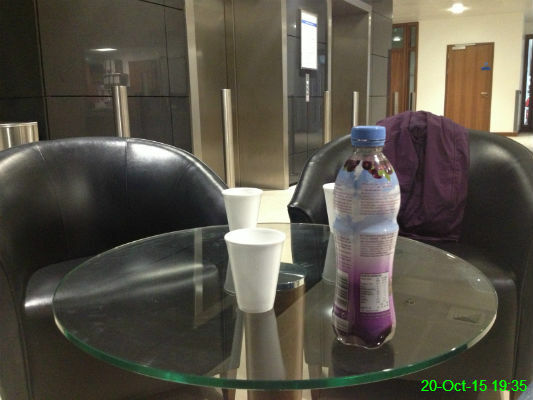 We spent a lot of the day waiting around for news on Chris, who is very poorly in hospital. We're all rooting for him and hoping he makes a speedy recovery. 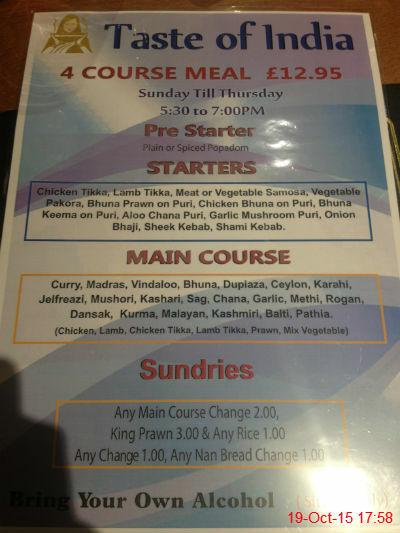 I can never resist the idea of an Indian special and since we ran out of time for getting a meal before the gig yesterday we made a rare Monday night trip to Taste of India. 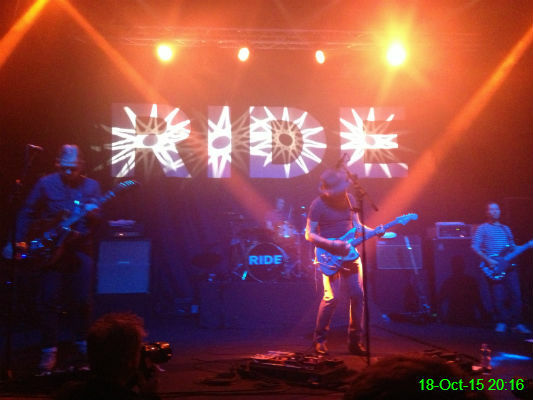 I went to see Ride at the O2 Academy with Michael and Paul. They put on a really good show and as it wasn't too crowded we were able to stand closer to the front than I would usually venture. 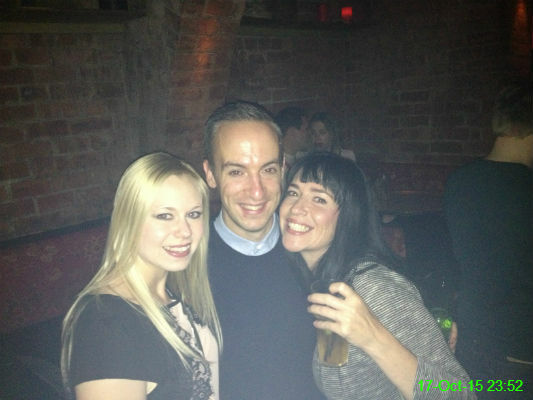 We had an excellent night at Lane 7 then Madame Koo celebrating Matty's 30th birthday. Here is the birthday boy with his fiancée Abby and his sister Nicole. I had planned to buy a hot chocolate on the way to work this morning but the weather put a spanner in the works by being extremely mild. 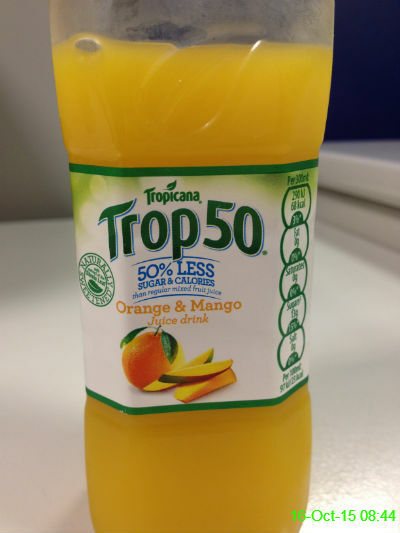 Instead I had this orange and mango juice as my "slightly more interesting than water" choice of beverage. 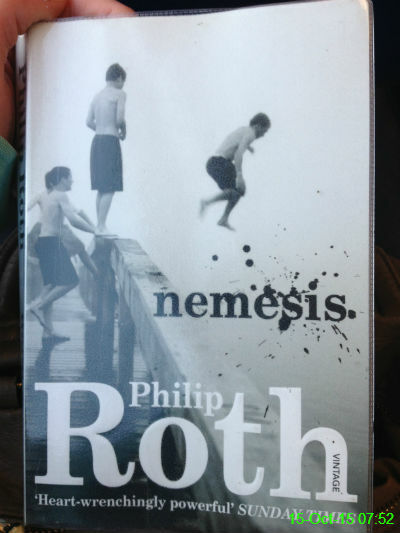 It's my month in the book club again and out of my 5 suggestions, Philip Roth's 'Nemesis' received the most votes. I chose the cheaper option, which was buying a used copy rather than downloading the Kindle version. It's an ex-library book so it has a cover on it, which is handy for someone like me who is destined to spill food/drink at any available opportunity. I only started it this morning and I'm nearly a third of the way through already, so I think I'll be finished well within the month. 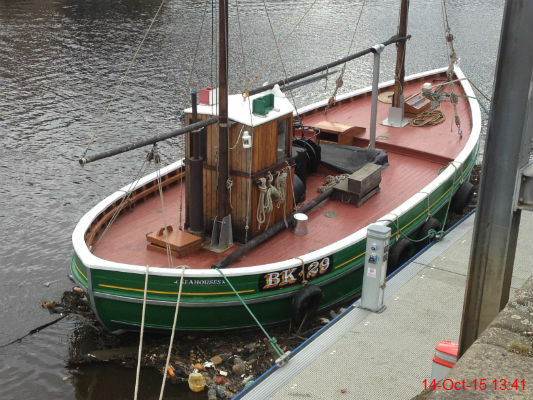 I was not impressed with the amount of rubbish and driftwood caught around the sides of this boat. 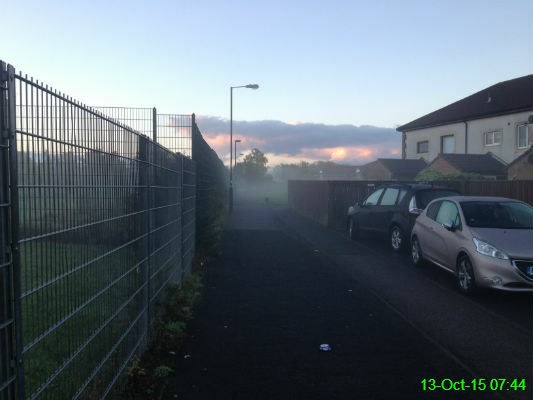 It had been clear until this point on my journey to the bus stop so I thought this was a fire at first, before I realised it was just a pocket of mist that had developed over the school field. 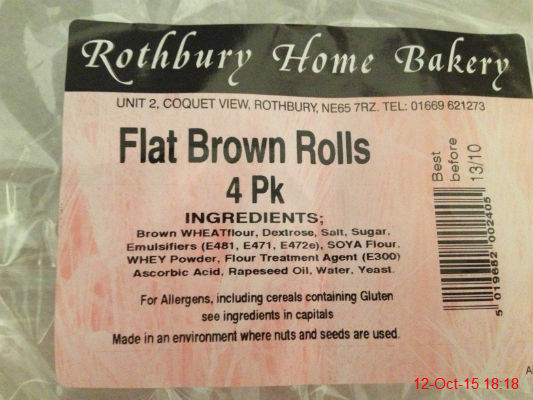 It was soup for tea, along with the last of these rolls. 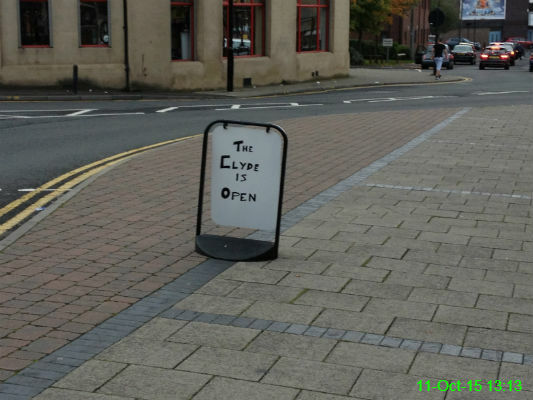 No expense spared on this advertising, but it was enough to persuade me to go in. This year the Lockwood Cup was Reds v Blues and the Reds came out victorious, with a 17-12 win. I had a lovely view from the balcony while they all ran around for 90 minutes! 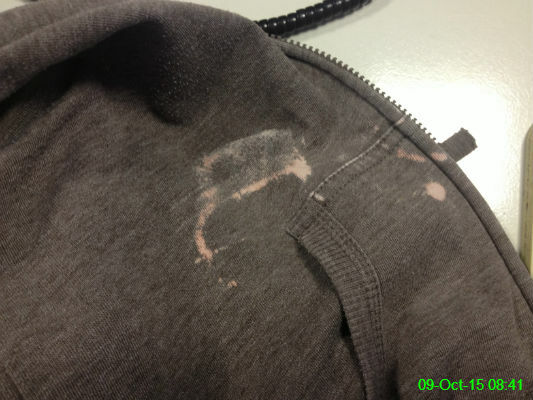 It's a good thing I was going to bin this jacket soon anyway, because today I picked up some bleach in the supermarket without using a basket and apparently there had been a leak around the outside of the bottle! 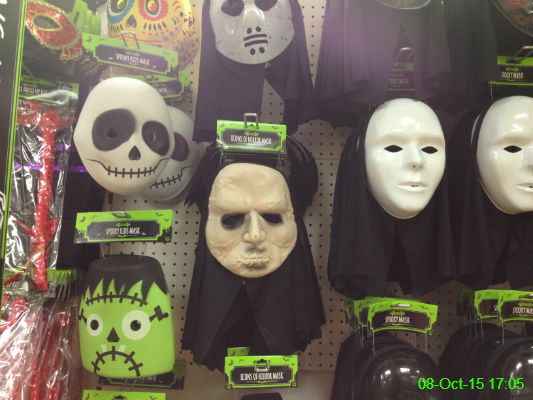 I was just thinking that these masks were pretty poor and definitely not scary, but then I remembered I was in Poundland. I don't think they're known for their amazing Halloween costumes. 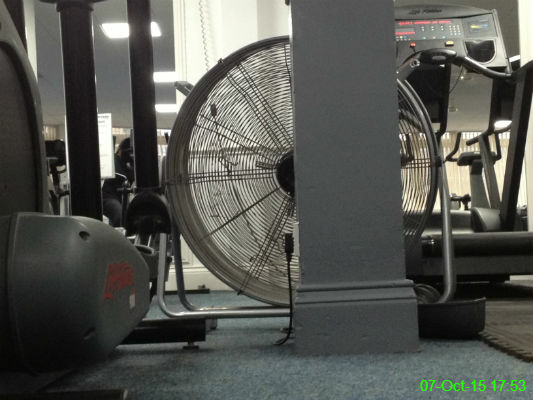 I was behind this fan at the gym and I was still nearly blown away, so I don't think I'd like to be on the other side of it! 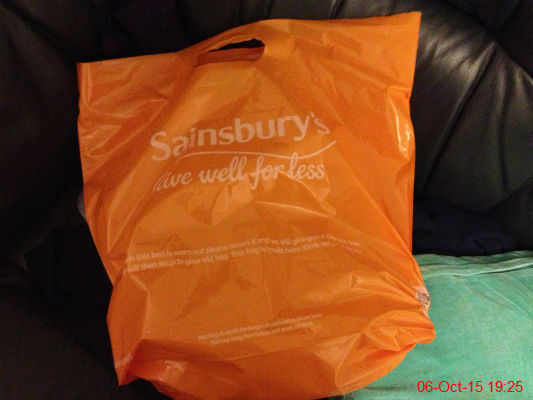 Anyone who has been stockpiling these is in luck as supermarkets now have to charge for them. 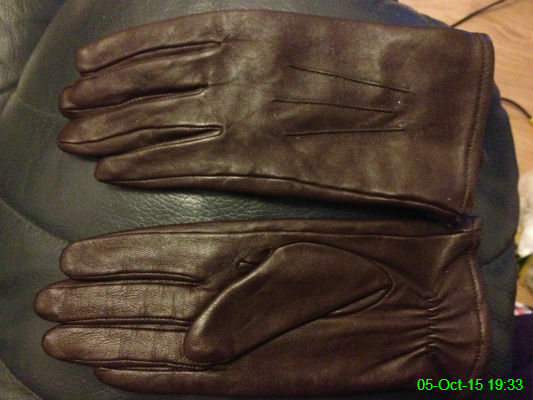 These were another of Gran's items which were in need of a good home and someone with as poor circulation as me can never have too many pairs of gloves! 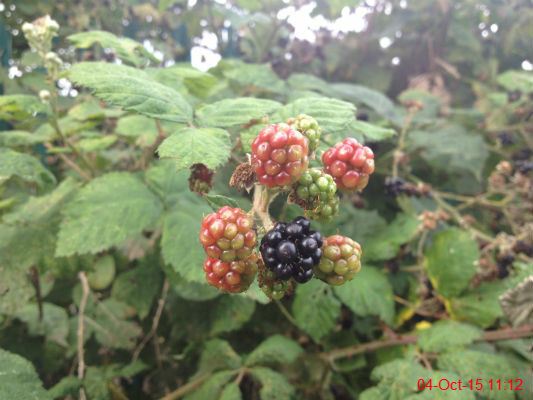 I thought these berries looked cute, but I didn't fancy risking eating them. 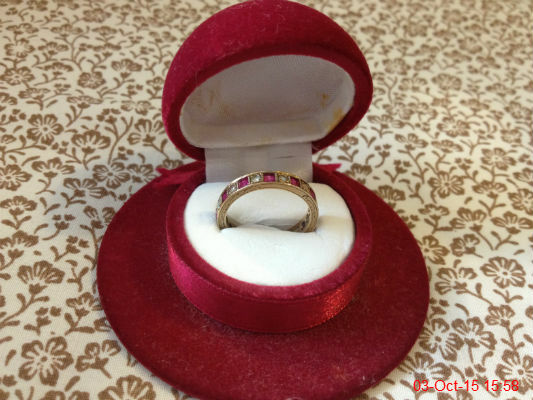 I spent some time going through some of Gran's belongings with Mam, Sue and Ali and I now have this ring as a keepsake. 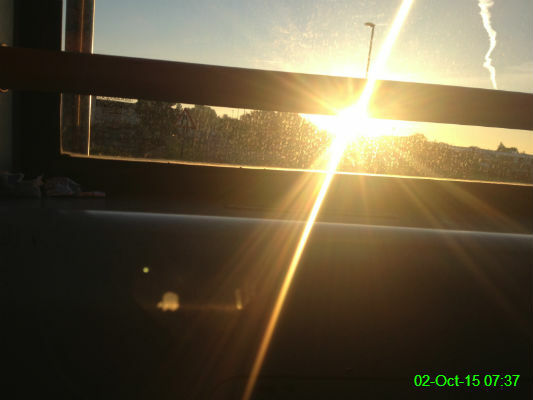 The sun was in good form as I got the bus to work this morning! I always complain that the cinema costs so much (£7.95) then promptly spend a fortune on snacks. 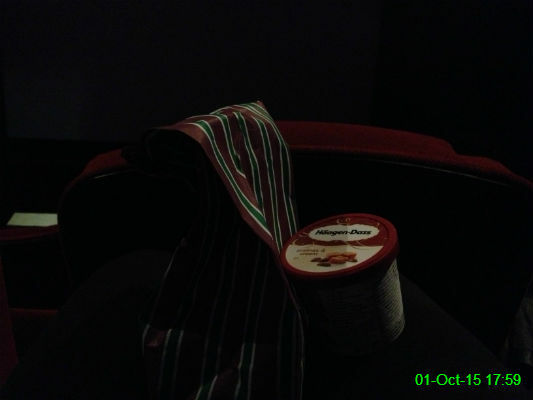 The ice cream and pick 'n' mix I selected to eat while watching Everest came to a slightly ridiculous £5.98! I blame the fact that I like heavy sweets such as fudge and pink and white mice, which is slightly preferable to admitting I'm just greedy.